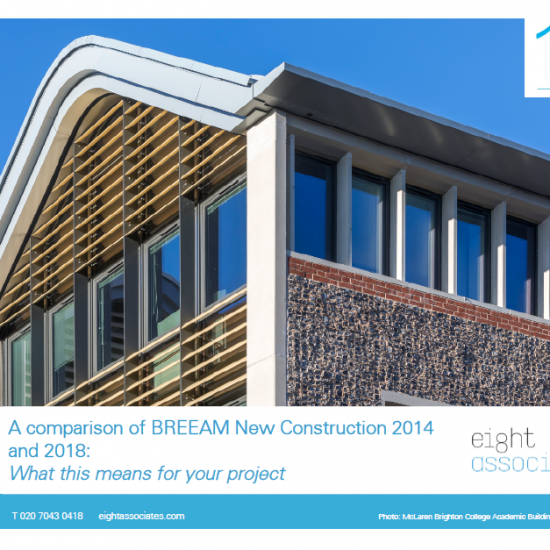 BREEAM New Construction 2018 – What are the potential impacts for your project? Free download. The BREEAM scheme is regularly updated to maintain its alignment with industry standards and push sustainability standards within the construction industry. The new 2018 update is no exception, with some fundamental alterations from the previous methodology. Eight Associates has put together a document to highlight the key changes that the scheme brings and we have estimated the potential impacts this may have on your future projects undertaking the BREEAM 2018 assessments. BREEAM New Construction 2014 closing date: As a reminder, please note that the BREEAM New Construction 2014 scheme closes for registrations on 23rd March 2018. Please let us know by 21st March 2018 if you would like us to register any of your projects under 2014 methodology. Download our document. We hope it provides a useful overview of the key changes that you should be aware of for the new scheme, and please get in touch if you have any questions.